While California is usually known for its car culture, it is also home to numerous bicyclists, both those who use their bikes for everyday transportation and those who ride for sport. Unfortunately, the high number of both cars and bikes on the road gives the state the tragic distinction of leading the nation in bicycle traffic deaths; 123 cyclists lost their lives in bike-auto collisions in one recent year alone (2012). Beyond the bicycle accident statistics are real people whose lives have been seriously disrupted due to such incidents, whether by suffering injuries or by losing a loved one. This page addresses the needs of those who’ve been hurt in these accidents; if someone you care about has died in a bike-auto collision, please see our wrongful death accident page for help. 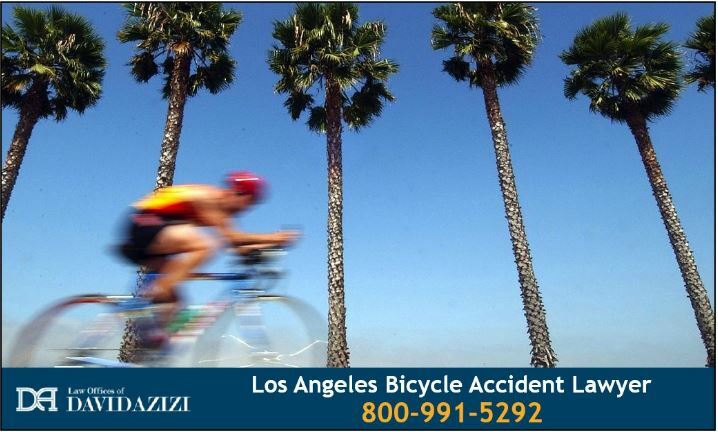 Please don’t hesitate to call us at the Law Offices of David Azizi if you’ve been hurt in a bicycle traffic collision. Often, these bicycle-car accidents are the result of driver carelessness and bad driving habits. If that is true in your case, you could recover your medical and other related costs through the legal process. David is a superb personal injury attorney who has helped many injured cyclists to get the financial compensation they deserve. We are available 24/7 at 800-991-5292. Whatever time of day or day of the week, we will quickly get you connected with David for a free consultation about your case. 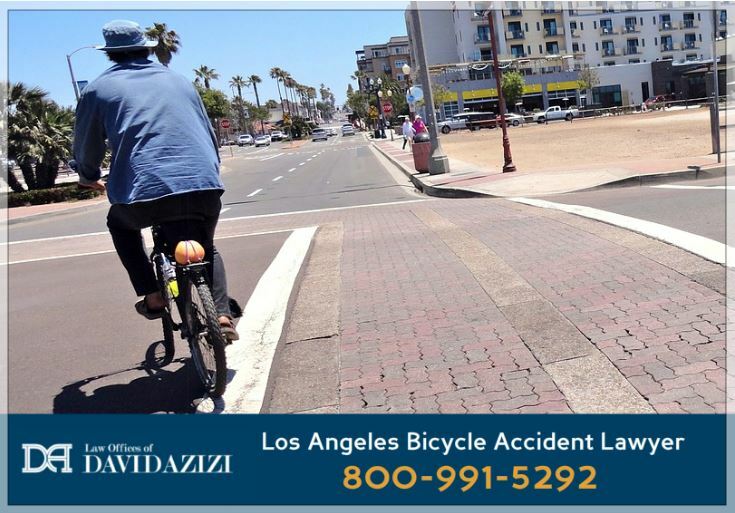 Injured Los Angeles-area bicyclists have turned to David because he is hands-down exceptional in three key areas of legal service; he’s experienced, effective and compassionate. He has been called one of the Top 20 Personal Injury Lawyers in Los Angeles by expertise.com. Most recently, the highly prestigious organization Super Lawyers named him one of Southern California’s best attorneys for the sixth time. You can trust David and his years of experience to represent you with excellence as you seek to recover your costs from someone else’s negligence. Los Angeles injury victims also choose him because he’s one of the best at what he does. David’s peers recognize just how good he is. The large legal services company Avvo gives him a “Superb” rating. According to the National Highway Traffic Safety Administration, most fatalities occur in the city. The majority of those killed in bicycle accidents are male and Texas, California and Florida lead the way. In addition, the age at which fatal accidents occur has steadily grown older. Today it is upwards of 45-years-old. Since bicyclists have no protection, injuries can be severe. Healing and being able to make ends meet, particularly when you are out of work, can be a daunting experience. Compassionate Injury Lawyer in L.A. Please call us at 800-991-5292, so we can get started working on your bike accident case right away. We’ll connect you with lawyer David Azizi very quickly for your free consultation, and you can take the first steps toward recovering what you’ve had to pay because of someone else’s carelessness.